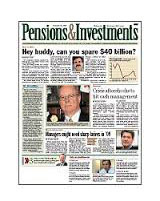 According to the U.S. Census report, the 100 largest U.S. public pension funds had a combined $3.192 trillion in cash and securities as of Dec. 31, up 4.3% from three months earlier and 12.5% higher than the end of 2012, according to the U.S. Census Bureau’s Quarterly Survey of Public Pensions. The asset total was the highest since the survey was first conducted in 1968; total assets topped the $3 trillion threshold for the first time in the third quarter, at $3.061 trillion. The public plans reaped $165.6 billion from investment earnings in the fourth quarter. In total contributions, 73% were provided by government sponsors and 27% came from employees. Government contributions totaled $27.6 billion, up 23.9% for the quarter and up 4.4% for the year. Employees contributed a combined $10.4 billion, a 25.5% increase from Sept. 30 but only 0.1% above the end of 2012. Contributions generally are cyclical, Ms. Becker-Medina said, more often made in the second and fourth quarters, which explains the large fourth-quarter increases. The top 100 funds comprise 89.4% of U.S. public pension fund assets. 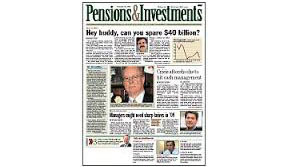 Read the article on the Pensions & Investments website.